← It’s National Pretzel Day! Make These Alton Brown Soft Pretzels! I am always on the lookout for one pot meal ideas. Whether they are made in the slow cooker or on the stove, one pot meals can make life so much easier, particularly during the week when you may not have a lot of time to throw together and entrée and a couple of side dishes and then have to deal with all of the clean up after the fact. When I came across this recipe from Guy Fieri of Food Network for a smoky Brunswick stew, it seemed to fit the bill perfectly and made use of all the ingredients that I already had in the pantry, refrigerator or freezer to make it even easier. While it may seem like a lot of ingredients, the whole meal comes together pretty easily for you and with some great flavor. Make the chicken marinade by combining the granulated garlic, brown sugar, paprika, dry mustard, cayenne and some salt and pepper together. Mix well then place the chicken thighs into a resealable plastic bag and pour the dry seasoning over the chicken. Seal the bag and shake it around so the chicken is seasoned evenly. Transfer the chicken to a roasting pan. Pour over the chicken 2 tablespoons of the chicken stock, the wine, Worcestershire sauce and the liquid smoke. Cover the pan tightly with foil then place it in the oven and roast the chicken for 30 minutes. Uncover the foil from the pan and continue to roast the chicken for another 30 minutes. Remove the pan from the oven and place it on the stovetop. Remove the chicken to a plate and turn the burners on to medium heat. Add the bacon and vegetable or canola oil and cook until the bacon is brown and the fat has rendered slightly, about 7 to 8 minutes. Using a slotted spoon, remove the bacon and set it aside. Add the garlic, celery, onions, peppers and potatoes to the pan and cook in the bacon fat until the vegetables are translucent, about 4 to 5 minutes. Using tongs, add the reserved chicken back to the pan. Cook the chicken to add a little color, about 2 to 3 minutes. 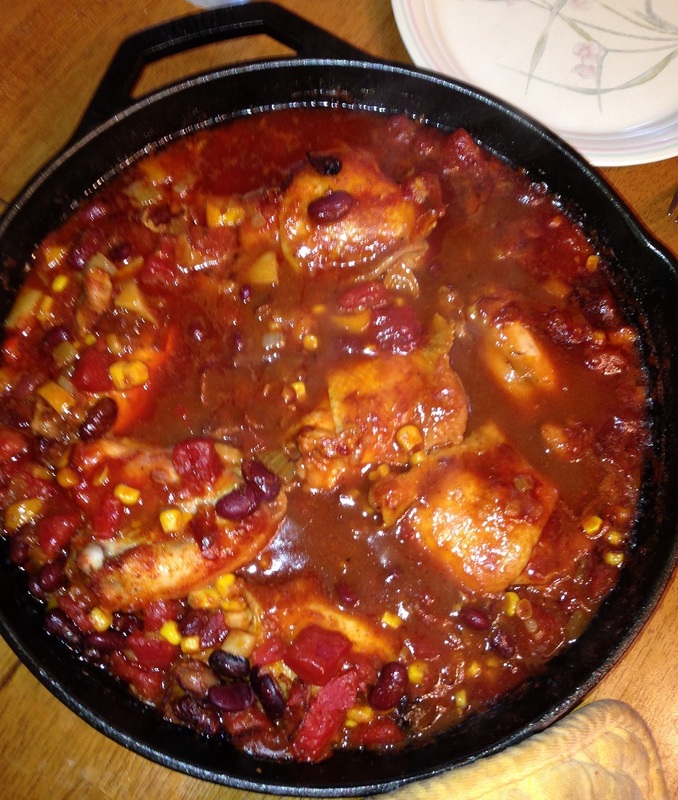 Return the bacon to the Dutch oven, add the tomatoes and their juices and pour in the remaining chicken stock. Stir well, and then simmer for 35 minutes, stirring occasionally. Add the barbecue sauce, corn, pinto beans and lima beans to the stew. Stir everything well and simmer the mixture until the chicken is very tender, the vegetables are soft and the beans are heated through, about 15 to 20 minutes. When the stew is done, stir ir well and taste. Season with salt, pepper and a few dashes of hot sauce, if desired, to taste. This dish had great flavor and the combination of the spices, vegetables and barbecue sauce really made it a hit. If you don’t have fire-roasted tomatoes around, you could easily substitute a can of whole tomatoes or diced tomatoes. The same goes with the beans added. I did not have lima beans on hand and put in some kidney beans instead and they were fine. The best thing about this dish, besides it being made all in one pot, is that it tastes even better after a day or two. We enjoyed it for lunches for a few days and the flavors just seemed to get richer and better each time. I’ll be making this one again as it was so easy to do and tasted awesome.